The time of sand is 5 minutes in this. Color- brown, black white. Yellow. - Use: It is used for decoration and timing purposes. Clients can avail from us, an astonishing range of ST – 2491017. These products are manufactured from high quality factor inputs in our well established manufacturing unit, as per the international quality standards. Our product range is treasured for its strong construction, high accuracy, problem free functioning and steady performance. 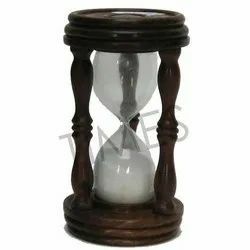 Owing to our in-depth domain expertise, we are providing an extensive array of Wooden Stand Sand Timers. Manufactured using premium quality raw material and advanced technology, our offered timer is in complete compliance with the international standards. Apart from this, the offered range undergoes stringent tests on defined parameters to deliver defect free range to the clients. this is antique wooden sand. it is made of wooden material and white sand. available in different size and timing of sand timer. These Wood Sand Timer Hour Glass 10-Minutes. 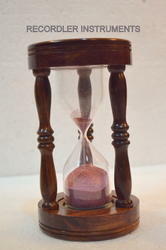 The sand timer is a wonderful gift or desk accessory. Made of natural wood with glass. The solid brass sand timer 8". Making this a beautiful addition to very nice nautical decorative gift solid brass home nautical decor - executive promotion for gift. We also offer our range at reasonable prices. Approximate Size Length:8 inch, Width: 3.5 inch. We Provide wide range of sand timer bookends for our clients. This sand timer is 5 minutes and 4 long. Comes with beautiful highly polished wooden bookend.